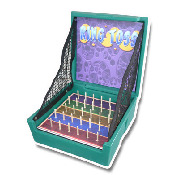 Play this classic Ring Toss game by trying to loop one of the rings on the many pins. Land on different colours for prizes. It's harder than it looks. Comes with 3 plastic rings.